Omnea makes it easier to shop online and answer the question, “which one should I buy?” Consumers tag and save products to Omnea as they search and browse from one retail site to another. Saving products to Omnea makes it easy to compare features, find the best price, and get feedback and alternative suggestions from friends. Retailers pay Omnea to present products to users based upon what they are looking for. 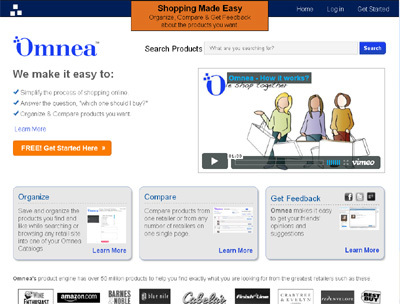 There are over 1,400 retailers with over 50 million products set up on Omnea. shopping at the exclusion of other activities and the fact that it works on all retail sites.